A first-time grandmother who hit the jackpot at Slotland.com last week will have a sack full of money for her Christmas shopping this year. The player known as ROBINSONJ, who’s expecting her first grandchild in the new year, won $78,112 playing her favourite Slotland game, the Jacks or Better video poker slot game. The jackpot winner has been playing regularly at Slotland for about three years. She said that she finds playing slots to be relaxing and entertaining but that she knows when to stop. Smaller wins over the years have kept her going, but this is the first time the avid slots player has won anywhere near this much money. This is one of the biggest progressive jackpots to be won on Jacks or Better. Just over a year ago another grandmother known as QAZMLP won $175,812 on the popular game. Slotland’s most recent jackpot winner was at the end of September when WINNIPEGLEG won $107,064 on the Wild Heart video poker slots game. To win the jackpot in Jacks or Better ROBINSONJ placed a $10 bet and then got a Royal Flush. Jacks or Better is one of 7 popular games that Slotland has recently released in a new Flash format that enables the designers to include even more incredible graphics and sound effects. 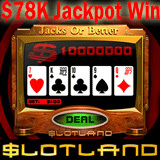 Like all Slotland games, their unique Jacks or Better video poker slots game is available only at Slotland.com. Slotland now has 19 one-of-a-kind slot machines and video poker slots games. Six of the most popular games are also available on mobile phones and PDAs. The jackpot at Slotland was reset to $50,000 after this win and is already over $60,000. Meanwhile at Slotland’s sister casino, WinADayCasino.com, the jackpot is over $80,000 after a $158K win earlier this month.